Super Heroes are big hits, aren’t they? No matter how many times the stories of Batman, Superman, or Spider Man have been told, there is always someone out there wanting to give their own unique spin with a new comic book, graphic novel, or block-buster movie. Maybe you’ve never considered this before, but the Avengers could actually be a pretty good metaphor for the way the gifts of the Holy Spirit work. Think about it: the Avengers each have different super powers. Alone, they are good at what they do: together they are AMAZING! The Holy Spirit gives each of us gifts, too. When we know the power of the Holy Spirit and we use our gift to serve God, it’s good. But when we work together it is AMAZING! 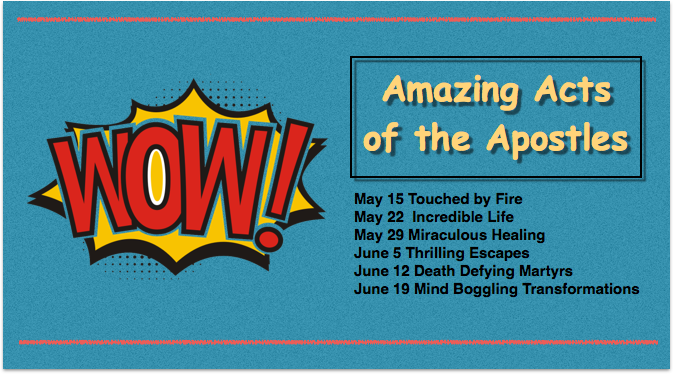 The sermon series, “Amazing Acts of the Apostles” will highlight the incredibly super-human feats that the Apostles performed after the Ascension of Christ. Together, they spread the good news of Jesus across the Roman Empire, and from there the news spread across the globe. Because of the power of the Holy Spirit, we are still gathering together on Sunday’s to witness God’s continuing work in creation and to worship and praise God! Please join us starting this Sunday to learn about the “Amazing Acts of the Apostles,” and then find out how we can bear witness to these acts in the life of the Body of Christ today. And the pericope we studied on Sunday, theMind-boggling transformation of Saul/Paul! See, Saul of Tarsus was a persecutor of Christians. It’s not that he was a bad person, he was just absolutely passionate about his belief in the God of Abraham. He had been trained in and strictly adhered to the LAW of Moses. He knew the Torah inside and out, and went to extremes to make sure there were no heretical teachings or misinterpretations of the LAW. He was 100% convinced that the teachings of Jesus were heretical. In today’s understanding we would call Saul a “radical extremist” or a “fundamentalist.” He was so passionate about God’s Law that he felt it was his calling in life to put Christians (at that time they were called “followers of the Way”) in jail. He had ordered them to be imprisoned and beaten, and was even present at the stoning of Stephen (we’re covering Stephen on this coming Sunday). The name “Saul of Tarsus” struck fear into the heart of every follower of Jesus. It’s similar to the way we feel in our hearts when we hear “Radical Islamists” or “ISIS” or “terrorist.” And that’s why, in the story of Saul’s transformation, we cannot overlook the importance of another transformation, and that was happening in the heart of Ananias, a disciple who lived in Damascus. But Ananias had already been baptized and transformed by the power of the Holy Spirit, and that Spirit guided him to place his trust in God. He faithfully followed God’s directions, laid hands on Saul, and Saul’s sight was restored. Immediately, Saul was baptized and began to preach Jesus as Christ — the Messiah. Saul, in this transformation, had to give up his teaching of the LAW. He realized that Jesus is the fulfillment of the law — there’s no conflict there. Jesus showed us that the whole of the LAW is love, and Jesus showed us how to live LOVE. Live LOVE. That’s what we pledge to do when we become believers. And that’s what we pledge to do when we celebrate baptism in the Presbyterian Church. On Sunday we celebrated the baptism of a precious child of God, Madison Rose. Her love of the water that I poured over her head was obvious, and her excitement at being blessed by every member of the congregation was evident as well. What a joy to celebrate the Super Power of Baptism as we pledged to live LOVE by supporting Madison Rose and her parents! It’s a mind-boggling transformation for every one of us, isn’t it? To remember that we do not just attend church for ourselves — not to “Get” something out of worship. We attend church because we are fulfilling the promise to model “how to live LOVE” to every child of God baptized in our church! And any time we can remember that it’s not all about self, and focus on others, that is a mind-boggling transformation indeed. May you always live LOVE! PS: To clarify things a bit — Saul is his Hebrew name; Paul is his Roman name. He was both a Jew and a Roman citizen, which served him well in his ministry. After Saul/Paul transformed and began preaching Jesus as Messiah, he left his life as a lawyer behind him. To make ends meet, he would occasionally step away from his travels and make tents. Today, we call a preacher/teacher of the Word who doesn’t work full time in the ministry a “Tent Maker.” It comes from Paul’s hard work sewing tents to make enough money to support his travels. Cool, huh? In the aftermath of the Orlando shooting at a gay nightclub in Orlando, we would do well to remember that Saul was a radical extremist, and we need to be as brave as Ananias in our response. I say this because there is rarely a case where I would be terrified to follow God’s call to go lay hands on someone, but the tortured soul who shot and killed 50 people in a nightclub is one of those cases. This young man was absolutely convinced that he was doing the right thing. He killed those people and injured so many others because his belief was so strong, he, like Paul, was 100% sure he was doing God’s will. But who among us would have walked into that nightclub (at the bequest of God) and prayed for him? I believe Ananias’ transformation then, is as mind-boggling as Saul’s. It took great faith to step into that home, with a heart full of love, convinced of God’s calling, and pray for his ultimate enemy. But he did it. And I implore you, in your beliefs, to know that God calls us to love and pray for our enemies. Be ready, because God may call you to love and pray for even those whose faith is so different from yours that feel called to try and harm you, or spew hatred at you. Remember that God’s call will always be to live Love. If you feel God is calling you to respond with hate or to reject any of God’s children — you’re not hearing God. Take time to reflect on the loving action of Ananias towards Saul, and remember that you, too, are called to live LOVE in every situation. I pray for your courage, and for mine, as we find ways to respond to every act of terror.